Mermaids Millions Video Slot Guide & Review - Casino Answers! Mermaids Millions is a 5-reel, 15-line video slot developed by Microgaming featuring scatter wins, wild substitutes, free spins and a bonus game. 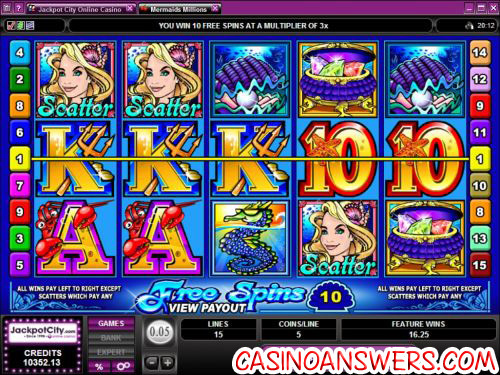 You can find the Mermaids Millions slot machine at King Neptunes Casino and Blackjack Ballroom Casino. To get started on Mermaids Millions, set a coin value. Your options are $0.01, $0.02, $0.05, $0.10, $0.20, $0.25, $0.50 and $1. Then you must choose how many lines you wish to play (up to 15) and how many coins you wish to bet per line (up to 5). The minimum bet on Mermaids Millions is $0.01 (or $0.15 on all 15 lines) and the maximum bet is $75. Hit “Bet Max” to bet 5 coins on all 15 paylines, or to spin the reels with whatever bet you have set, hit the “Spin” button. When the reels spin, you will hear an underwater bubbles sound effect, which is a nice touch. The top fixed jackpot in Mermaids Millions is the King Neptune wild symbol worth up to 7500X your bet. The Neptune wild symbol substitutes for all symbols except for the scatter and bonus symbols. If three or more mermaid scatter symbols appear at the same time, you will win 10 free spins with a 3X multiplier. Scatter wins will be multiplied by the total credits staked. All wins are tripled during free spins. Free spins can be re-triggered. All bets and lines played during free spins are the same as the game that started the free spins. Switch Mermaids Millions into Expert mode and you will enable the video slot’s autoplay feature. In the autoplay feature, you can set the number of spins (5, 10, 25, 50, 100, 250 or 500) and to stop once all spins are complete or to stop if a win exceeds or equals ($25, $50, $100, $250, $500, $1000 or $2500). Autoplay will stop if any feature is triggered. You may cancel autoplay at any time. We think Microgaming did a very good job with Mermaids Millions. Due to the nature of being a 15-line slot, Wins are very common and the special features in the video slot are easily triggered. The maximum bet isn’t too high – only $75, but that is still more than enough for most players. If you like the underwater mermaid theme of the Mermaids Millions slot, you’ll love playing Mermaids Millions at King Neptunes Casino. If you sign up there, you can get a 100% signup bonus up to $100. Are American players able to play Mermaids Millions? 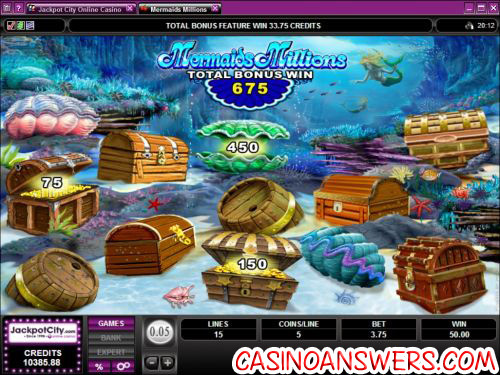 Players from the United States cannot play Mermaids Millions at Microgaming online casinos. For an alternative, we recommend you try playing some of the fun video slots over at Silver Dollar Casino. Is there a fruit machine with a similar theme to Mermaids Millions? Yes, you can play Deep Sea Dosh at King Neptunes Casino. For more on Deep Sea Dosh, please read our Deep Sea Dosh Fruit Machine Review. What special features does Mermaids Millions have? The Mermaids Millions video slot has a bonus game feature and a free spins feature. To trigger the bonus game, you need three treasure bonus symbols. To win 10 free spins with your winnings tripled, you need three scattered mermaid symbols. You can trigger the bonus game during the free spins feature. What casinos have the Mermaids Millions slot machine? Is there a Mermaids Million progressive jackpot?